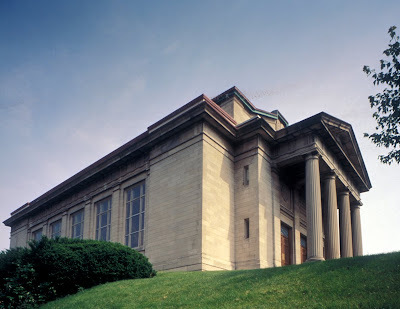 My Upcoming Lecture: "Temple Concord, Jewish Architecture and City Beautiful"
You are invited to the upcoming (free) illustrated talk “Temple Concord, Jewish Architecture and City Beautiful,” at Temple Concord next Monday, April 11, at 6 pm. The talk is part of the on-going celebration of the centennial the National Register listed sanctuary which will culminate with a public re-dedication in September. The talk, co-sponsored by Preservation Association of Central New York (PACNY), is part of Temple Concord’s ongoing series featuring Syracuse University faculty presenting their work to an audience further down the Hill. 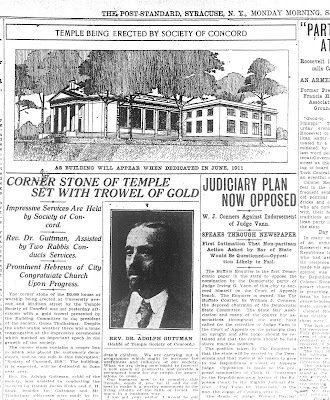 I will discuss the architecture of Temple Concord in the context of American synagogue design, the evolution of Reform Judaism and as an example of early 20th century civic architecture. The talk will address several of my ongoing research/activist interests – synagogue architecture, the history of urban planning, and the past and future of Syracuse. 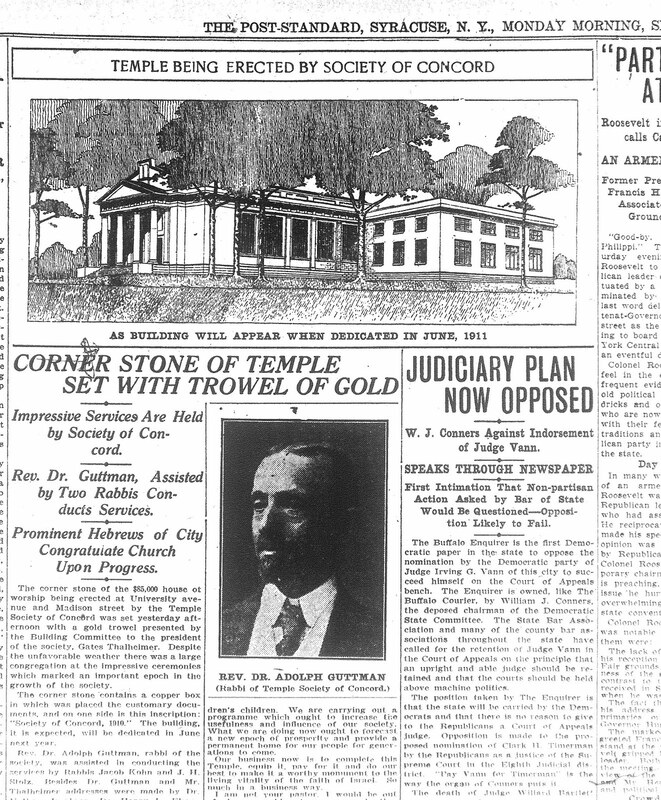 Just as today; Concord when designed and built (1909-1911) was literally a pivotal building on the Connective Corridor. 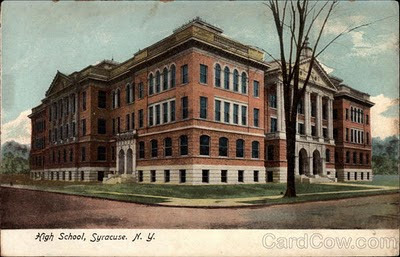 Its design had roots in consulting-architect Arnold Brunner’s (with Alfred Taylor) past work and writing about the origins of the synagogue, but it also was tied to the new Neo-Classical plan adopted by Syracuse University in 1906 and the completion of the new County Courthouse downtown the same year. 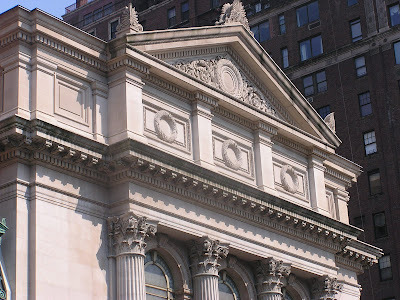 lecIn 1910, Brunner, who was the favorite architect of the New York Jewish establishment, became president of the American Institute of Architects New York chapter. He was nationally recognized as the leading designer and historian of synagogues in America, but also as one of the country’s foremost urban planners, thinkers and the most public and articulate spokesperson for what he called “City Practical.,” but which we now think of as the City Beautiful Movement. The same year that Concord was dedicated, Brunner’s Cleveland Federal Building was also completed culminating Brunner’s decade service with Daniel Burnham and John Carrere as the triumvirate behind the famed Cleveland Plan.